Norwegian offers some of the most generous reward schemes in the skies, allowing passengers and companies to earn CashPoints which can be used to make cost savings on all Norwegian flights at any time. The Corporate Bonus scheme, where companies earn rewards for all flights booked by the company, their employees or through their travel agency. Rewards on the Corporate scheme have now been increased allowing companies to earn 12% CashPoints on Premium and Economy Flex tickets to all destinations. The Direct Discount scheme, where companies can enjoy an immediate discount applied to every flight a company books. The Discount scheme has now been increased, allowing companies to earn an 8% discount on Premium and Economy Flex tickets to all destinations. 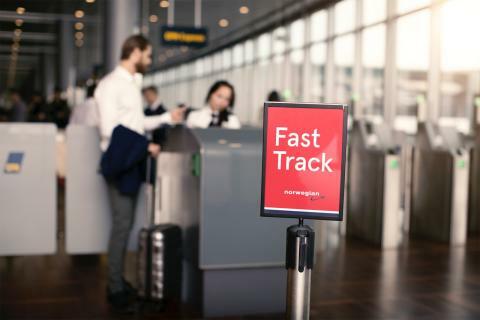 Lars Sande, SVP of Sales and Distribution at Norwegian said: “No other airline can offer a compelling low-cost business travel proposition like Norwegian. Our business customers can enjoy brand new aircraft equipped with free WiFi on all European flights and we fly direct to the world’s top business destinations including London, New York and Berlin at affordable fares. 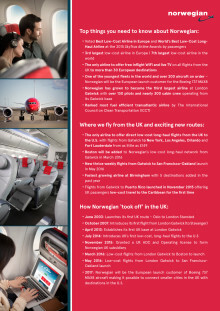 Members of Norwegian’s popular loyalty programme, Norwegian Reward can also earn CashPoints up to 30 days after departure. Norwegian has been voted ‘Europe’s best low-cost carrier’ by passengers for three consecutive years at SkyTrax World Airline Awards, and was also the first airline to be awarded the ‘World's best low-cost long-haul airline’ in 2015 by SkyTrax.